View More In Icing Dispensers & Tips. MATERIAL - Made From Durable And Fine Grade 304 Stainless Steel. They Are Created Using A Seamless Welding Process, They Never Rust And Handle Stiff Icing Without Ever Losing Shape. FDA APPROVED AND SAFE TO USE - The Decorating Kit Is FDA Approved To Be 100% Free Toxins, Ensuring Your Family Is Kept Completely Safe. The Lack Of Sharp Seams Also Makes The Icing Set Safe To Use By Kids When Decorating Pastries Or With Their Craft Projects. PERFECT CHRISTMAS/FLOWER CAKE DECORATIONS - The Latest Decoration Set That Is Ideal For Newbies Or Professionals. You'll Have Everything You Need To Start Decoration Your Cakes, Muffins, Cupcakes And Cookies With a Professional Touch. LARGE SIZE TIPS - You Can Now Create Beautifully Grand Decorations With Ease; Everything From Enticing Flower, Bell, Santa Claus, Gift, Mistletoe, Christmas Tree, Snowflakes And Drop Designs. 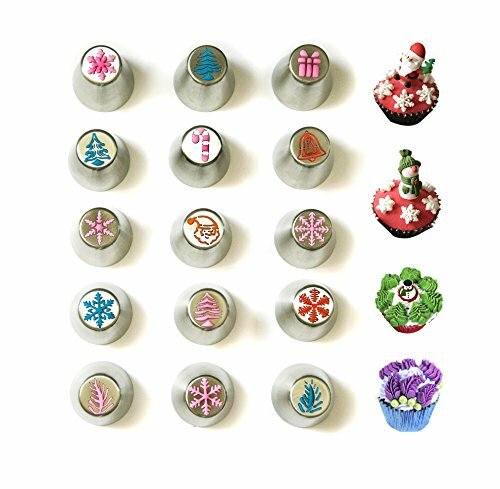 GREAT KITCHEN GIFT - Whether It's A Birthday, Housewarming, Anniversary, Christmas, Thanksgiving Day Present You're Looking For, This Russian Tips Set is Guaranteed To Put A Smile On Any Baking Lover's Face. If you have any questions about this product by JJMG, contact us by completing and submitting the form below. If you are looking for a specif part number, please include it with your message.